Using Ozone for odour removal has been somewhat controversial. On one hand, this naturally occurring is responsible for the clean, fresh feel and smell in the air after a thunder storm. On the other, it is equated to pollution concentrations on “bad air” days. So, is it a good idea to use ozone, especially from an environmental standpoint, to rid your home or business of bad odours? First, let me explain what ozone is. Ozone is simply three oxygen molecules bound together. This molecule is created when 2 oxygen molecules are passed through a highly charged environment (like a lightning storm, or in an ozone generator, over highly charged plates). The molecule that is created is very unstable and one of the oxygen molecules will readily attach itself to other surrounding molecules. When this happens, the remaining 2 oxgen molecules are simply the pure oxygen all life needs on this planet, while the lone oxygen molecule that attached itself to a different molecule will oxidize and destroy the other. This process allows Ozone to destroy bad smelling molecules, bacteria, viruses, moulds, and fungus, ultimately leaving no toxic residue behind. Sound like the perfect, safe solution, right? Well, you do need to be careful when using ozone generators in your home or business, because ozone does not discriminate between the biological organisms we like (our selves, pets, plants, etc). and the foul smelling molecules we are trying to get rid of. So, when we are applying large amounts of ozone to an area (shocking), we need to make sure that we, along with our pets and plants, are out of the area. Ozone, however, reverts back to oxygen very quickly, so we and our house-mates can return to a fresh and clean smelling home or business quickly. How quickly does ozone revert back to oxygen? The half life of ozone is just 20 minutes, so within a couple of hours of shocking an area, you can safely return. Many ozone generators, like the Jenesco units available at www.ozonegenerators.ca have timers built into the units, so that you can set the units to ozonate through the day, and turn off a few hours before you get home. Likewise, in a business environment, like deodorizing a locker room, you could turn the unit on when everyone leaves for the evening, and have it turn off automatically a few hours before everyone arrives in the morning. One of the greatest benefits of ozone generators or chemical based odour treatment solutions is that there is no toxic residue once the ozone has quickly dissipated. 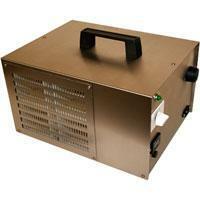 Ozonegenerators.ca sells the Jenesco brand of ozone generators in Canada. These ozone generators are well build, many featuring stainless steel enclosures, timers, variable ozone output levels, and more. They have units from small, portable ozone generators that are perfect for deodorizing sporting equipment like hockey and football gear, to large units designed for restoring fire and mould damaged properties.